Man, Christmas is coming fast!!!! I still have not show you all my craft projects I've done! These Christmas trees were an easy little project to go up on the shelves in my family room. I bought three different styrofoam cones from a craft store. You can also make them out of cardboard to save some money though! For the largest tree I used this beaded garland that I always see in the clearance bins at craft stores but never know what it is for...still don't know what it's for but it looks good as a mini Christmas tree!! And then hot glued it on the top and kept wrapping it around until I got to the bottom! 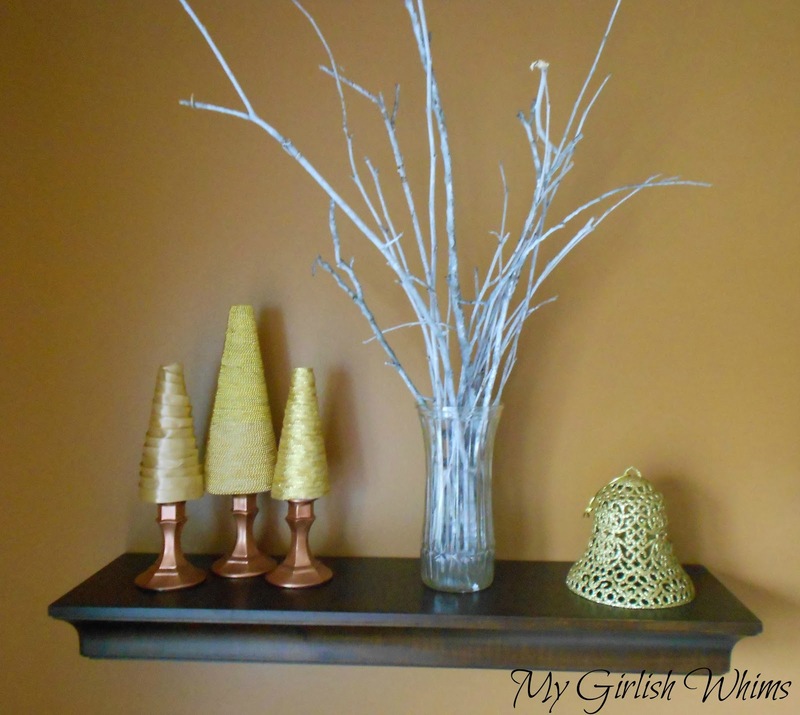 For the tree bottoms I bought candle holders from the dollar store and spray painted them a copper color that matches my wall color but also coordinates well with the gold! A bunch of hot glue was good enough to attach them. I'll show the rest of my shelves with one more Christmas wreath craft a little later this week! Yes! I'm with Bethany. I've looked and refused to buy them every year for a couple years. I will break down one of these days. So adorable!!! 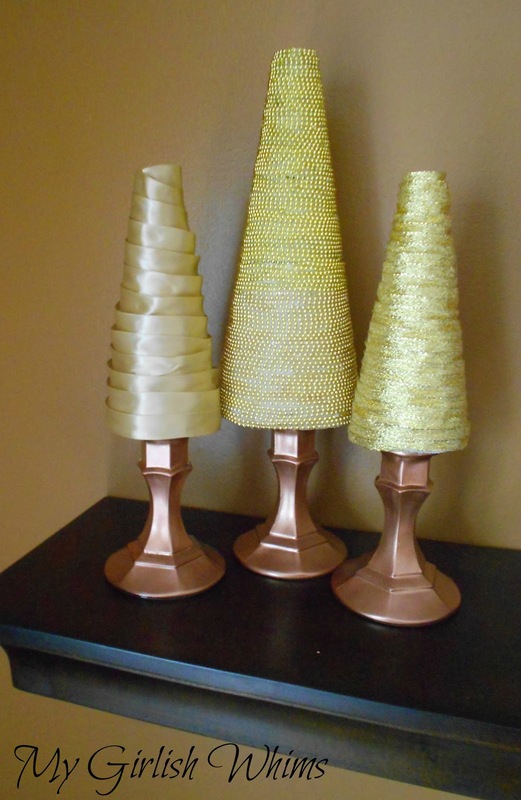 BTW, they have tree cones at the dollar store you can get and decorate as well. :) I got a couple that already had gold glitter on them! They aren't necessarily foam but they will certainly work as well. Absolutely gorgeous! I'd love you to come link up at my Pin Me Linky Party. I really like that you added the candle holders as a pedestal. It really adds some glitz & elegance to them! Very creative and cheap project. Thanks for sharing! How pretty. I love that you put them on the candlestick holders. They look so pretty!